Britain has tipped into deflation for the first time in more than half a century. Prices, as measured by the consumer prices index (CPI), fell by 0.1pc in the year to April, following zero inflation in February and March. that the economic and monetary union is irreversible"
THE DAILY TELEGRAPH: Commission president says Grexit exposes the euro to huge danger as capitalist forces would try to dismantle the EU "piece by piece"
The president of the European Commission has risked angering Britain after comments warning that the "Anglo-Saxon world" would seek to dismantle the European project if Greece was ever allowed to leave the single currency. 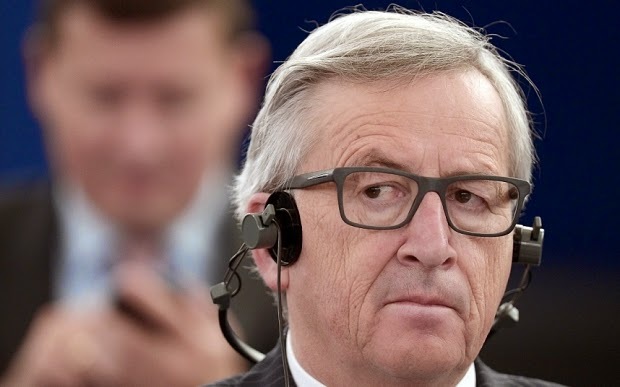 Speaking to an audience at the Catholic University of Leuven in Belgium, Jean-Claude Juncker said a "Grexit" would leave the euro prey to forces who "would do everything to try to decompose" what remained of the monetary union. “Grexit is not an option," said Mr Juncker. "If we were to accept, if Greece were to accept, if others were to accept that Greece could leave the area of solidarity and prosperity that is the eurozone, we would put ourselves at risk because some, notably in the Anglo Saxon world, would try everything to deconstruct the euro area piece by piece, little by little."